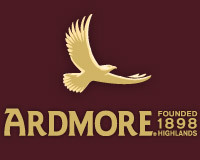 Ardmore Single Malt Scotch Whisky has recently been relaunched by owners Beam Global, with the first official bottlling for many years: Ardmore Traditional Cask. With an excellent reputation historically this new bottling has capitalised on this and has produced some excellent quality whisky in the last decade. Similiar in many respects to Laphroaig’s Quarter Cask bottling you will be pleasently surprised at Ardmore’s properties.